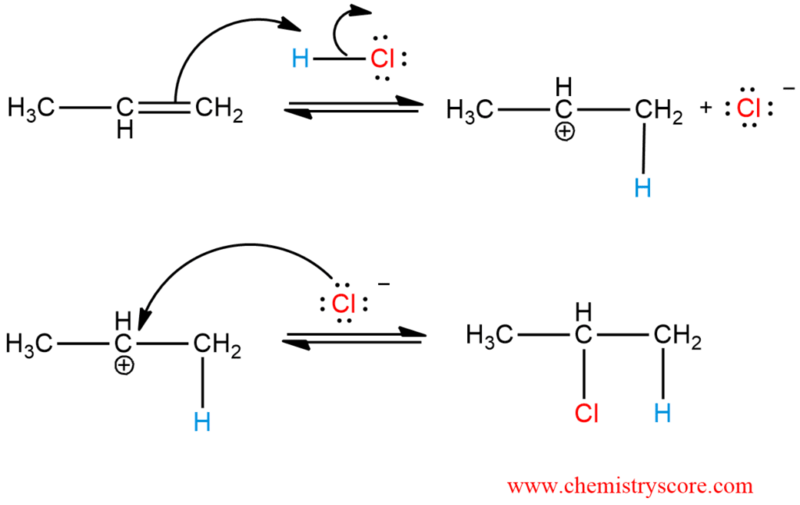 Treatment of alkenes with hydrogen chloride leads to the chloroalkanes. This reaction is called hydrochlorination. It is very simple when the alkene is symmetrical. However, in cases where the alkene is unsymmetrical, regioselectivity in electrophilic additions is predicted by Markovnikov rule. Let us consider the reaction of propene with hydrogen chloride. The proton of a strong acid HCl may add to a double bond to yield a carbocation. This proton attaches itself to the less substituted carbon. As a consequence, the halogen ends up at the more substituted carbon. This phenomenon is called Markovnikov rule. Protonation can occur with either of two regiochemical possibilities. It can either occur to form the less substituted, primary carbocation, or occur to form the more substituted, secondary carbocation. As we can see, the partial positive charge is on the primary carbon of the transition state, so the primary carbocation is favored. But it does not occur and this product is not observed. Now, when the partial positive charge is on the secondary carbon of the transition state, it leads to secondary carbocation. The regiochemistry of the reaction is determined in the first step, in which the proton attacks the π system to give an intermediate carbocation. Carbocation generation is rate determining; once it occurs, reaction with chloride proceeds quickly.